A good meeting starts with an agenda. If you and the other participants are not prepared, your meeting will turn out to be a waste of time. Compare preparing your meeting, with studying for an exam; If you don’t spend time preparing yourself for the exam you will fail. Meetings are the same, with one huge difference; preparing a good agenda with MeetingKing takes very little time and effort. *MeetingKing is already effective if only the organizer has a MeetingKing account. When you email the agenda, all recipients will receive a complete document. Invitees can access and contribute to your meetings with a a FREE account. *When you create a new meeting you get a meeting worksheet. Here you add the information for your agenda AND minutes. 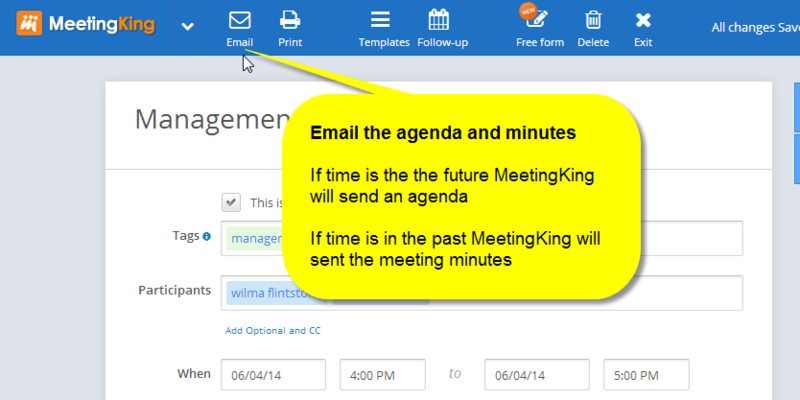 The print and email buttons will create an agenda document if the time of the meeting is in the future and a meeting minutes document if the time is in the past. 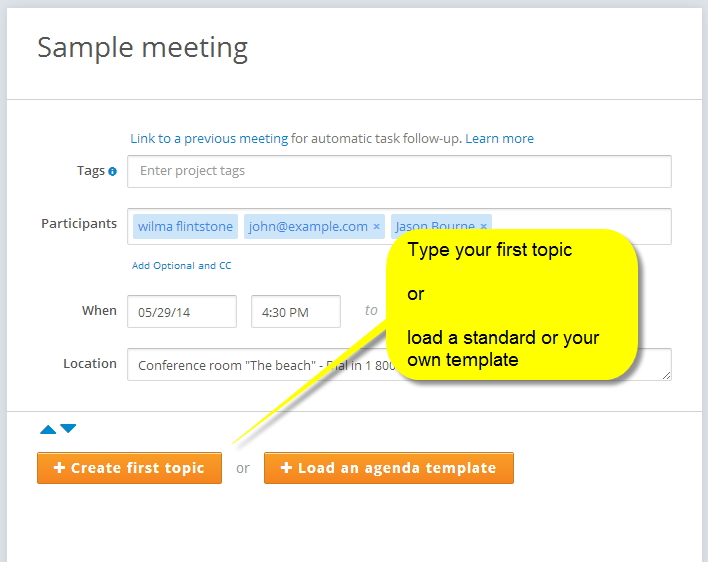 In your meeting you simply click the Add Topic button to add a new topic. Type the topic title and optionally you can add a presenter and/or time allotted. You also have the possibility to create subtopics under your main topics. To make it even easier you can also load an agenda template. You have a choice of standard MeetingKing templates and you can easily create your own. Read more on meeting templates. You can simply change the sequence by dragging and dropping your topic in a different spot. The topic numbers will automatically be updated. You can use the same drag and drop functionality to move any topics to and from your parking lot. To make sure everyone is well prepared for your meeting you can add notes and even tasks under each topic. You can also attach files to these notes and tasks. This way everyone will always have access to the most recent version of the agenda and the accompanying files. No more hunting for the latest email, no more updating of the Word doc and resending it to all participants. Note: you can also make private notes for yourself right in the agenda and note taking area. More on private notes. Once you are happy with your agenda you can click the email agenda button. This will send the agenda to all participants and all information will be in the body of the email message and in an attached PDF file. So even if the invitees don’t have a MeetingKing account you will be much more efficient.